More than 60 global mobility professionals were welcomed to EY’s London headquarters on 15th February for the first FEM London Chapter Meeting of 2017. After a short networking breakfast, as Head of Content at FEM and London Chapter Lead, I was pleased to welcome the audience and our panel of experts. Sarah Dyce, a Partner at People Advisory Services at EY began the meeting with a presentation about the digitization of tax and conveyed some thought-provoking insights into which countries of the world are now recording and monitoring data for tax purposes – which included some surprising locations. Steve Wade, Executive Director at People Advisory Services, EY, followed this up with a clear and concise explanation of the roll-out process in the UK and again, included some red flag issues which might not have immediately been clear to most of those who have read HMRC’s information on the subject. Then, after a brief preview of some of the key findings the FEM Policy in Practice Report 2017, I used some of the headline responses to begin the panel discussion. Alex McSporran, Head of Consulting and Training at International SOS and Control Risks highlighted the fact that the world’s 'high risk' destinations are not just the ones that business would have previously pinpointed and that there are many risks to employees and business travellers beyond the more obvious ones of terrorism, crime and disease. This led to the panel discussing just how risk is defined and that the degree of risk can vary, not just because of the activity involved, or the location, but can also be affected by the individual’s gender, religion or sexual orientation – and that this is still a very difficult area for GM professionals to address. 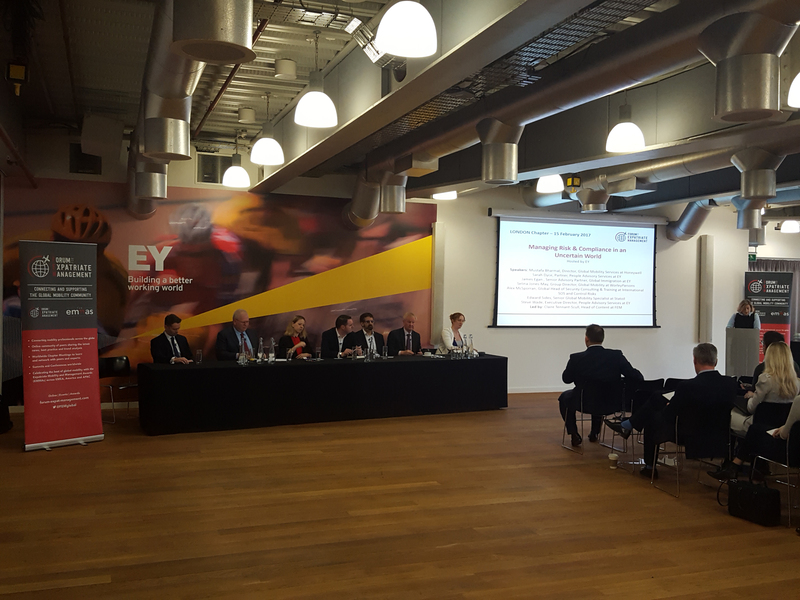 James Egan, Senior Advisory Partner, in Global Immigration at EY pointed out that in some jurisdictions it may be illegal to even ask an employee about such things, but that they are increasingly affecting the outcome of an assignment. Selina Jones-May Group Director of Global Mobility at Worley-Parsons shared an interesting example of how she and her team had responded to a crisis when she spoke about receiving news of Donald Trump’s abruptly announced Executive Order on immigration, and what she and the team at Lloyd's Register created and put in place to deal with this and similar issues in the future. Ed Sides, Senior Global Mobility Specialist at Statoil picked up on many of the points that Selina highlighted when he spoke about the difficulties in balancing the needs of the wider business – and the organisation’s duty of care and compliance requirements – whilst also managing expectations. Being in the energy industry, Ed has extensive experience of moving employees to difficult locations and emerging markets at short notice, and he also shared some fascinating insights into where the next relocation ‘hotspots’ are most likely to be. Mustafa Bharmal, Director of Global Mobility Services at Honeywell, gave tangible examples of the need for the Global Mobility function to effectively communicate with the wider business and to convince all departments of the need for robust risk management within their policies. He and Selina concurred that it is vital to update policies and procedures to be able to be able to produce an agile and damage-limiting response when faced with sudden change or dramatic events. Although there were also some excellent questions from the audience, the panel engaged with one another so effectively that they analysed, questioned and debated the main issues within the topic very effectively and the feedback from the attendees afterwards confirmed this impression. James Egan predicted that the confusion and controversy over the new American Administration’s immigration policies is far from over and that there are likely to be reciprocal changes in policy from those seven countries affected by Donald Trump’s so-called ‘Extreme Vetting’ order. Slides from the presentation will be available to all those who registered to attend, so if any members were unable to make it, they should please contact Marianne.aronsen@centaurmedia.com to request a copy. As I stated at the meeting too, our annual report, Policy in Practice Report 2017: Managing Risk and Compliance in an Uncertain World will be officially launched at our Houston Conference on 28 February, but attendees at our London Chapter Meeting are able to request a PDF copy which will be sent to them after the official publication. FEM would like to thank EY for hosting the event, our distinguished panel of speakers and of course all those who registered to attend. Or register on our website and get in touch with me, Claire.tennantscull@centaurmedia.com if there are any topics that you'd like us to discuss.